To evaluate the long-term course of primary angle-closure ocular hypertension and primary open-angle ocular hypertension and possible risk factors for progression to glaucoma. 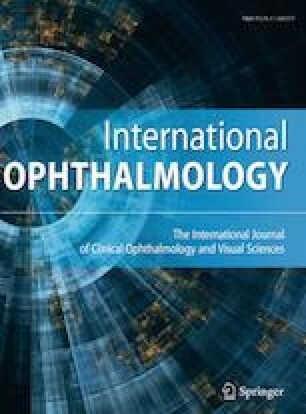 A total of 109 eyes of 109 ocular hypertension (OHT) patients with a minimum follow-up period of 5 years having complete ocular/medical records were evaluated. They were classified into primary angle closure or primary open angle based on gonioscopy at baseline. Baseline and review data of Humphrey field analyser, HFA, and Heidelberg retinal tomography, HRT, were recorded. Guided progression analysis (GPA) and univariate Cox regression were used for time to event analysis in identifying progression to glaucoma. Over a mean follow-up of 12.18 ± 4.8 years, progression to glaucoma was 17.43% (19 eyes), out of whom 5.5% (6 eyes) showed ≥ 3 loci on GPA. Sub-classifying them, progression to primary angle-closure glaucoma was 19.72%, and that of primary open-angle glaucoma was 13.16%. The mean time to progression was 9.34 ± 3.6 years. Significant risk factors included small disc area (≤ 1.99 sq.mm on HRT), requirement of ≥ 2 drugs to maintain target IOP and those engaged in activities yielding a Valsalva effect in daily life. Coronary artery disease (CAD) and systemic use of steroids were associated with increased severity. Overall progression of OHT to glaucoma was 17.43% over a mean of 9 years, with target IOP of ≤ 18 mm Hg. Patients with smaller discs, CAD, exercising Valsalva type activities and using ≥ 2 glaucoma medications or systemic steroids should be closely monitored. The procedures performed in this report involving human subject were in accordance with the ethical standards of the institutional research committee and with the 1964 Helsinki Declaration and its later amendments. Informed consent was obtained from all the participants of this study.